A reception befitting the prestigious award and to welcome our honored guests was held on September 5th at the Blaine City Hall where the Speaker of the Minnesota House, Kurt Daudt, presented the Civil Air Patrol’s highest honor, the General Carl A. Spaatz Award, to Cadet Colonel Zophia Raleigh. Other political dignitaries in attendance that evening included District 37A Representative Nolan West and City of Blaine Mayor Tom Ryan. 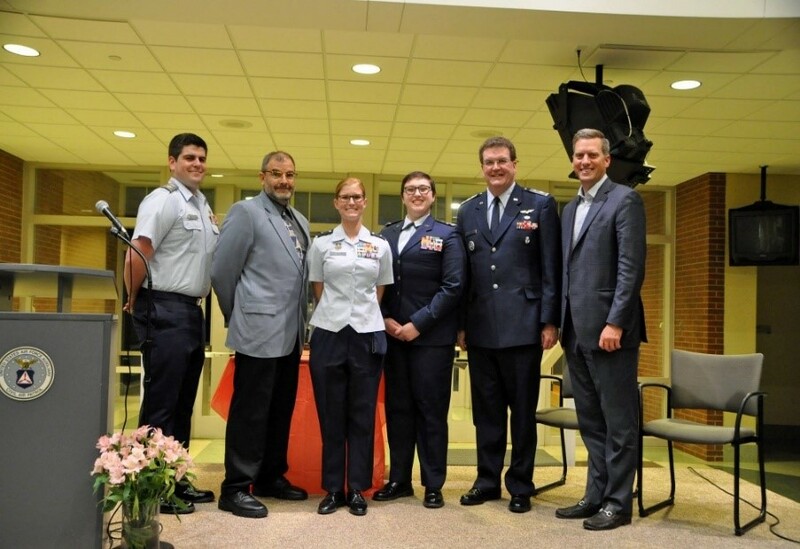 Participating in the ceremony, were fellow Spaatz recipients; Lt. Col. Douglas Rutherford (#442), Mr. Jay Sliwinski (#851), Maj. Matthew Frame (#1845) and Cadet Col. Caitlin Albright (#2004). Following in the footsteps of her father and brother, Zophia Raleigh joined the Civil Air Patrol at Anoka County Composite Squadron, at age twelve. Working her way through the vigorous program, she began with level one as an Airman and progressed through sixteen achievements to become a Cadet Major. With only two more awards left, Cadet Raleigh dug in her heels and began to prepare for the top award that only 24 out of 24,000 cadets have earned this year nationally. After successfully passing the leadership exam, aerospace exam, written essay, and a physical fitness test, Zophia Raleigh was promoted to Colonel, the highest grade a cadet can earn. Along the way, she learned leadership skills, communication techniques and character development. These skills were utilized at the squadron where she assumed many roles, eventually leading up to Cadet Squadron Commander. Six times attending the weeklong encampment held at Camp Ripley, she held positions of Flight Sergeant, Flight Commander, and Squadron Commander. Serving on the Color Guard Team, she presented the colors at numerous activities, including a regional competition where she received the Outstanding Cadet Award. Cadet Col. Raleigh began her CAP career as a participant but through the numerous opportunities, has excelled with the leadership skills that she was taught. Not only has she grown in her CAP career but also at school where she was a member of the National Honor Society, served on the Student Council, and was a peer leader helping disabled students. She attended University of Northwestern St. Paul her junior and senior years of high school as a PSEO student and is currently studying Agricultural and Food Business Management at the University of Minnesota Twin Cities. Along with the Spaatz Award, Cadet Col. Raleigh received the Eagle Award presented to her by the Minnesota Wing Commanders former and current, including Col. Kevin Sliwinski, Col. Thomas Theis, and Col. James Garlough. Zophia’s drive and passion for excellence is a way of life for her in all that she does. As most students her age are just entering into the real world, Cadet Col. Zophia Raleigh has been training and participating there for many years.